You can also pretend as a male in this video and in real life? I find this 5555. Thank you very much for this wonderful and very helpful lesson. YOu create very good scenarios and then take the time to explain every bit of it, which is very helpful. Great Video again, Its a shame that all taxi drivers are not as beautiful as you. mai dtong tawn pan baht wow mdter mai dai song roi baht 555 🙂 another great roleplay. welldone. I like your haircut very much, it’s really cute. The role play is the best. Korp kun khrap Kru Mod. The only problem is the white lettering on the video is hard to see from 11:21 minutes, with the backdrop of the white room and your white blouse. I like this video clip, thank you Mod. Last time I was in Bangkok, I managed to get some discount with the taxi driver. Next time I could do better! Sawatdee ka Matthias, thank you for sharing the clip with me, funny stuff. I really like it. Thank you both for this lesson. 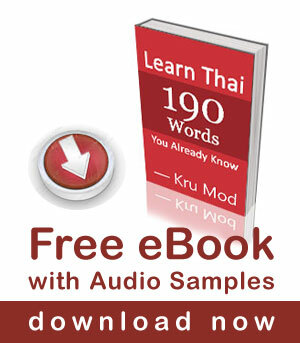 Thanks for yet another fun & interesting lesson to learn Thai. I was in BKK in June and paid 800baht for taxi ride from Siam Sq. to Yaowarat, not knowing I was conned!! But I am still looking forward to going back soon. Thank you. Cheers!